« Are dead fish worth more than live person? Could be… Let’s ban fishing too. John Cook’s 97% consensus paper was never going to tell us anything about climate science, so it does seem somewhat pointless to analyze the entrails. It was always a marketing ploy. If it had been done well it might have been useful as a proxy for government funding in science. But it wasn’t, so all we’re left with is some insight about the state of academic competence. Finding a consensus should have been easy. After all, billions of dollars of funding has gone to find some evidence (any evidence) that CO2 causes a crisis, and entire research departments have been set up to produce papers to discuss that. And if they didn’t find evidence (they didn’t), they could still write papers discussing the bias of instruments, the error bars, the adjustments, and so on and so forth. What are the chances that hordes of scientists would not find anything to publish? We also know that while believers were being employed left, far-left, and center, quite a few skeptics were sacked. Sometimes skeptical papers got delayed by up to two years, while there was usually a rapid-print option for believers. Once, a whole journal was even shut down for publishing skeptical papers (the sin!). The data is hidden. Either Cook et al didn’t keep it (and are incompetent) or they did but it does not reflect well on them and they won’t release it (they are incompetent and deceptive too?). The raters were not independent. 7% of the ratings were wrong, and biased. The ratings data shows inexplicable patterns. Cook et al fail to report that their data fail their own validation test. Most of the papers were irrelevant. Those authors were writing about “impacts” or “mitigation” of climate change and not about the cause of climate change. Obviously skeptical scientists will not write about “mitigation” or “impacts” of climate change, so including these papers (and there are thousands) served the purpose of increasing the total number of papers claimed to be surveyed and also increases the percentage of “consensus”. That is an utterly predictable outcome. Good PR, lousy design. It’s not a representative sample, and Cook did not test to see if it was. The paper is used to make profoundly unscientific statements in the media. Cook et al endorse the fallacies. We shouldn’t blame John Cook entirely though. Surely the standards here are a reflection of those at the University of Queensland, and the University of WA (where he is doing his PhD). Isn’t his supervisor Prof Lewandowsky? A claim has been that 97% of the scientific literature endorses anthropogenic climate change (Cook et al., 2013. Environ. Res. Lett. 8, 024024). This claim, frequently repeated in debates about climate policy, does not stand. A trend in composition is mistaken for a trend in endorsement. Reported results are inconsistent and biased. The sample is not representative and contains many irrelevant papers. Overall, data quality is low. Cook׳s validation test shows that the data are invalid. Data disclosure is incomplete so that key results cannot be reproduced or tested. The conclusions of Cook et al. are thus unfounded. There is no doubt in my mind that the literature on climate change overwhelmingly supports the hypothesis that climate change is caused by humans. I have very little reason to doubt that the consensus is indeed correct. Cook et al., however, failed to demonstrate this. Instead, they gave further cause to those who believe that climate researchers are secretive (as data were held back) and incompetent (as the analysis is flawed). It will take decades or longer to reduce carbon dioxide emissions to zero—the only way to stabilize its atmospheric concentration. During that time, electoral fortunes will turn. Climate policy will not succeed unless it has broad societal support, at levels comparable to other public policies such as universal education or old-age support. Well-publicized but faulty analyses like the one by Cook et al. only help to further polarize the climate debate. It would be nice if these Marxist pseuds could actually do something well once in a while. The conclusion I draw goes along the lines of ‘Brewery organise can’t in up piss a a’. Is the University of Queensland a refuge for [snip] ? Yep, the Snips have to go somewhere. We don’t want them wandering about, and lying down in the middle of the road, every time their collective brain gets overloaded by having two thoughts at the same time. I have forgotten what I wrote. I think it was ‘degenerates’, let’s see f that is snipped! This posting reminds me of James Delingpole’s article about the Left/Liberal brain and its products, nonsense, adhom attacks, unreasoning, fear of debate, etc. He ascribes the cause to the inability to control the “Monkey brains”. “This is the question asked by Foster in his superb new book Why We Bite The Invisible Hand: The Psychology of Anti-Capitalism (Pleasaunce Press). And he comes up with some fascinating answers. This explains why there is such a stampede to flood the media with ridiculous claims, theories, attacks, etc. Unfortunately for us, that never stops them. Normal persons may feel a sense of embarassment or shame when they are proven wrong on an issue. Not so for the left/liberal. The idea that they are wrong never gets passed the monkey brains defenses. Truly fascinating. 2. Do a Google or Google Scholar search on some key words. 4. Run whatever silly survey can be cooked up. 5. Find the support for TI. 6. Ignore or toss out all data not supporting TI. 9. Just keep pointing at the MI (media ink) forever. Forget the paper. It can be critiqued, dismantled, deconstructed and scoffed at as much as those sceptix like. Their criticism will never be published. We got the ink first!. Nyah nyah nyah! Once it’s published, the MM (Mainstream Media) move on. They don’t care if it is all wrong; if it helped sell a few more papers or can be measured in web page hits, then it’s done it’s job. For this issue. I wouldn’t call that propaganda per se. But it certainly defines the current delivery model very well. It’s third party advertising of government policy. It’s more insidious than government advertising because many people are fooled into thinking it’s independent. Because it is so bloody obvious, that is why. Good propaganda will have people debating what brand of suppository to use, without anybody questioning why anything needs to be inserted at all. My comment was meant to imply that Cook et al are rank amateurs. Sorry if it offended. I liken it to the modern wrecking of our language. Many people say “haitch” instead of “h”. Its a pet peeve of mine. Back in the day, it used to be a sign of poor schooling and/or laziness. Now, becasue its common place ( perhaps becasue our education system is poor state of repair ) poor/lazy becomes “OK”. Wrong is still wrong, and at the end of the day, being able to speak properly will set you appart for all the right reasons. Yes OK, mea culpa – I am private school educated, however pronounciation isnt costly nor hard to master. I digress, but you get the idea…. Curious, I don’t think I’ve noticed this even one time. ax, libary, calvary, foilage, nucular sure, but never haitch. A trend in composition is mistaken for a trend in endorsement. I consider it virtually impossible for Cook et al. to have written their infamous propaganda without full and explicit knowledge of what they were doing. They understood the low wattage, leftist/green MSM would peddle it with the uncritical enthusiasm of yodellers in an echo chamber and they also understood that their hiatus would leave an indelible imprint – 97% believed – and that folks, was their goal. They were insanely successful. And by the time the article had been dissected to its rotten entrails, the insane would already have marched on to their next clamour-fest, the dissection a side show of historical artefact. Tol’s article now needs to be injected into the internal carotid of every politician, MSM idiot savant and confirmation biased member of the handwringing Conversation. Tol is still very much one of the alarmist. He still thinks that there is a large consensus out there. He is just cranky at Cook for making such a monumental hash-up with this paper trying to prove that meaningless consensus. To who ever runs this laughable site. I have been skeptical of the CAGW scam for years and have written on many blogs to say so. You are oviously as talentless as John Cook when it come to internet research. When we talk about consensus lets be absolutely clear about what kind of consensus we mean — There is no consensus of scientists in general on climate change, but there is a consensus of government funded officially approved climate scientists. Often the terms “scientists” and “climate scientists” are interchanged and usually to the advantage of those who pretend consensus’s are important. Such confusion is quite understandable. The UWA and QU were considered by some to be seats of higher learning. Cook and his PhD supervisor are stark examples of the level of teaching at those institution and of the research they find acceptable. I have difficulty believing that taxpayer funds are being used to fund these people and their so called research. Are either of these universities complaining over funding cuts? If so I know where they could claw back a few thousand dollars. Just to add to the chorus this stuff is about political PR. Cook’s stock in trade is communications. One of the oldest tricks in the lobbyists’ books is to create an apparently authoritative report in support of a particular policy and promote it extensively. Capital cities are packed with consultants and researchers who make money out of these activities. What we have here is a not too sophisticated version of the same – had it come out of Canberra it probably would have been better done. The mistake is to try and deal with it in the terms in which it purports to be operating (a serious study) rather than its actual purpose – lobby fodder. The thing is ridiculous (like Lew.’s recent contribution to journalism) and the question to ask is why UQ funds political activists – if the university had employees funded solely to convince the public of the benefits of euthanasia (say) we’d want to know why. The same applies to Cook. - Are ideological supporters of the dangerous anthropogenic global warming message and will use anything to support that position without checking or caring about it’s validity. In a world where the media were unbiased and driven by seeking and revealing the truth, this article would be headline news because so many of our political leaders, climate scientists, journalists and public commentators on the subject of climate change have quoted the ’97% of scientists’ statistic. They would be keen to correct that position. I wont hold my breath waiting for this to be reported by the mainstream media, but in particular the ABC, Fairfax, The Guardian, Crikey, or The Conversation. I also wont hold my breath for a GetUp! campaign to educate the public! Science, to a degree that verges on the deplorable, leans very heavily on an ethic of trust. Scientists realize that they cannot be universal experts, nor do they have the time to replicate studies, or to dig through SI for data to reanalyze. So they allow colleagues who claim “specialist” status to inform them, very like the media does but with less excuse. Trust however can be withdrawn if there is a clear reason to do so. It happened during the earlier 20th C in psychology over inheritable intelligence, criminality and eugenics (e.g. the Jukes and Kallikaks). You can see this happen in climatology when a clear reason for revoking trust intrudes. Judith Curry, for instance, would very likely still be in the AGW camp rather than the “lukewarm” were it not for Climategate which revealed precisely how untrustworthy some of her colleagues were, and worse, the deliberate manipulation of peer review. Such events however have a shelf life and given time, will fade in significance. The interval between Climategate and the present means that, for whatever purpose the agenda is being pushed, and I do not see it as either truly leftist or “green,” the “opposition” can now act to recover lost ground. I’ve been re-exploring climate-data adjustment issues and I’ve begun to wonder whether there really has been any warming in the last 50 years. It seems the alarmistas will have to increase their gatekeeping budget and thuggery. Letting 3%+ of non-compliant papers through must be pretty much tantamount to treachery. They say that it is genocide of humanity and wonton destruction of the world. And some actually believe it is. Yeah, never mind all those entirely valid criticisms – it passed *PEER REVIEW®* so it’s gospel, and of course does not provide any evidence whatsoever that all Cook’s ‘peers’ are equally incompetent. What happened to my profession? These scumbags would be laughed at in my field, not lauded and certainly not cited by Obama’s minions. If it doesn’t get a nudge on soon, it will be lucky to get above freezing this year !!! And while all the supposed warming is hidden, the next ice age has begun. 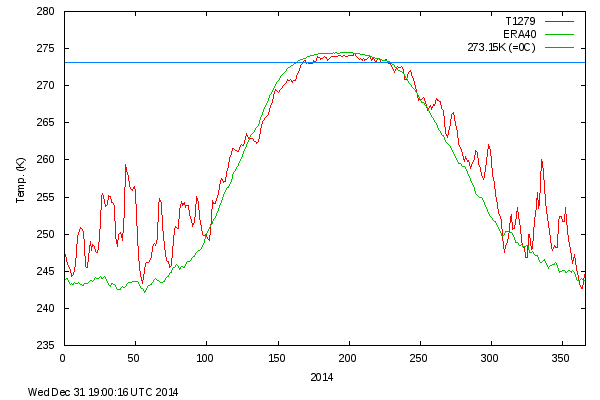 But last summer had the shortest period above zero Celsius, in quite a long time. If it doesn’t get some warmth from somewhere, this year could have an even shorter period above freezing. This post is great and illustrates the benefits of a “scientific” analysis. Points 1 to 9 very clearly detail the issues and demolish the original Cookism as a piece of science. As HAS says the Cook Paper is 97% COMMUNICATION. The other 3% may be seen as science because it mentions a few scientific terms and presumably got the spelling right. Professor Tol’s paper is only the opening gambit against Cook, the kitchen sink is still coming down the pipeline when the FOI information is released. Richo – after seeing what’s happened at the Universities of Virginia, Delaware and Pennsylvania, UQ and UWA, etc. etc., I find your quaint belief in the impartial and fearless application of FoI quite charming. Cook et al are maniacally ‘flogging a dead horse’. What is it that causes such people to be incapable of accepting responsibility and just admit they made a mistake? Instead of being responsible they play the victim, take any criticism personally, launch into gobsmacking personal attacks and even try to reinvent the past. They will also torture numbers unmercifally to make them admit to anything. The whole point of Cooks paper was not about the probity or otherwise of the method and analysis employed. It is not about science, or even about facts. No, the main point of the paper was to punch through the usual apathy and disinterest that the general public held on CAGW at the time – to get THE MESSAGE out. I doubt if Cook realized at the time but the whole idea of having a simple, if irrelavent or fictitious, message repeated many times can sway many people to your cause. And the Cook paper is an outstanding success of carrying this idea of message (the idea of 97% agreement) being far more important than the material. Joseph Goebbels would have been so proud that his methods and style were redeployed to such good effect. This is where the Lewandowsky paper failed badly for it was over-complicated, attempting to appeal to the educated elite – they easily saw it’s manipulations and flaws. Lewandowsky, unlike Cook, has neither the base talent, nor the brashness of the natural propaganist. Cook’s paper got his message out – politicians, newspaper pundits, some scientists and of course the braying chorus of the true believer, all have recited the 97% message. And thus emerges the action of Godwin’s rule once more, not that the OP is wrong – he’s not. Has there been any REAL WARMING in the last century or so ? Or is it all from data manipulation? No agency or individual can tell with any certainty how much warming/changing/weirding, if any, is attributable to natural variation and how much to AGW influences. Throw in dodgy, manipulated data sets and you have more long bows being drawn than when Henry the Fifth lined up at Agincourt. Its an embarrassment to anyone who puts their name to it really. I keep watching this and wonder when the dam is going to break on this. USHCN are only spending public money manufacturing temperatures, instead of measuring them, then using such results to prove global warming. The dam has to break soon Tomomason. A couple of regulars on Steve’s site have suggested he pulls together all the information he has on temperature tampering and write a book or at least a report. At one stage he said he didn’t have the money to do it , but another poster suggested he email him as money could be found. I don’t know if anything happened. BUT someone needs to do it!! If anything really needs an audit, it is the way that “climate” data is adjusted, and the effects. What I am seeing is that adjustment may account for nearly all warming since about 1970 and all warming since the late 1990s. The real problem is tracking down clear expositions of why data is being adjusted. NOAA has posts up and copies of publications, but a good deal of the explanation seems to include unsupported assumptions, and while there’s an almost coherent argument regarding adjustments to data through about 1960, there seems to no clear justification after that, and although the argument might be coherent for pre-1960ish data, it is not at all clear that there is a proven case of need for the adjustments. File it under the heading “Just another useless waste of University funding”. We can only wonder as to why their funding might be cut by a Government tired of left wing naval gazing at tax payers expense. Problem is we have almost no “scientists” in parliament. In order for an MP to know that there is “a useless waste of university funding” you have to have an appreciation of the subject matter. Currently we have an “emperor has no clothes” situation with MPs unwilling to speak out in case they look stupid. Richard Tol has just published a peer-reviewed critique of Cook et al. I have just looked at Dana’s “rebuttal“. There are a few themes that occur elsewhere. 1. Don’t recognize your opponents abilities, achievements or status. E.g. Tol is a Professor of Climate Change Economics, and has published over 200 journal articles. 2. Don’t link to an opponent’s website, but only to a denigrating description of it at desmogblog. 3. Only link to opposing pay-per-view papers, not to freely-available layman summaries. 4. Never acknowledge your opponent may have a point, or that your argument may have some weaknesses. 5. Falsely give the impression that you gave full data access when in fact you threatened legal action to prevent publication. 6. Accuse somebody of hacking or stealing data, when they merely followed links carelessly left around on publicly available sites. - carefully ignore/miss the entire point of the critque. Exactly. Just as the “97% Consensus” defense of a “scientific” hypothesis is simply on how many people believe in it, not because helps us understand the real world. It is a proclamation of their collective ignorance. The Watson that beat the all time jeopardy greats with ease has been studying oncology at the best institute in the USA. I know people like to poo-poo singularity concepts, but you’re living them already, and ever moreso in the near future. The average persons’ vision is generally focused too closely on the here and now and not taking in the bigger picture. These are the things that give me hope for the species … oddly that hope lies with machines. Just wanted to add… because of the rate at which computer technology advances in power (Moore’s Law), which shows no signs of abating, the typical person could get a Watson-equivalent PC in their palm (or implant?) within a decade or so for a moderate price. Just as you think nothing of having a GPS on your phone, it may be nothing in a decade to have your personal physician on a mobile app. If it doesn’t get a lift on soon, it will be lucky to get above freezing this year !!! ps.. The auto mod really hates the link for some reason.. tried 3 times and have 3 posts in moderation. I wonder if John Cook and Stephan Lewandowsky read what we say about them on this blog? If so do they comment under some pseudonym? Ha Ha! that is funny. No need for fossil fuels now that the CSIRO has developed solar thermal electricity plants. But what happens when the Sun doesn’t shine. It will take decades or longer to reduce carbon dioxide emissions to zero—the only way to stabilize its atmospheric concentration. I suppose that if burning of Fossil Fuel was the only or even the major contibuter to increasing CO2 concentrations, then reducing emmissions to zero would stabilize the CO2 level. But what if it is not the main contributer? Then reducing emmsiions to zero would not stabilize CO2 levels. The contributions to the CO2 levels in the atmosphere and the residence time and other factors are still a matter of conjecture. At present there is a correlation between increasing use of fossil fuels and increasing CO2 levels. However Professor Murry Salby has challenged this correlation. Soon after that he lost his job at the UNSW! Meanwhile Richard Tol accidently confirmed the 97% consensus to within +/- 1% in his follow-up analysis. Oops! Nice own goal, Tol! The whole thing was a meaningless load of propaganda. I’m amazed they even let that small percentage past the gatekeepers. And if you then compared this to the funding available, even 97% is a pretty darn poor showing. !! Why have you posted this? Again, lets be careful about the language. The Consensus means what? A consensus of all scientists? No. Not now, not ever. Tol is referring to a consensus among approved “Climate scientists” publishing papers which turn up in keyword searches. I wish everyone (including Tol) writing on “The Consensus” would use exact terms. Too darn right it doesn’t matter. Consensus is a meaningless term in real science. The 97% consensus is about as relevant as a left wing dictator getting 97% of the popular vote at a single party election. A good video from Prof Ross McKitrick on Obama’s latest scam. The European Union risks losing ground in the fight against climate change as it tries to shore up energy security in response to concerns about dependence on Russian gas, said John Prescott, the bloc’s lead negotiator for the 1997 Kyoto Protocol. The annexation of Crimea by Russia has pushed the issue of energy security to the top of the European political agenda as the 28-nation bloc devises plans to cut reliance on natural gas imports from Russia’s OAO Gazprom. That risks overshadowing the debate about cutting greenhouse gases, according to Prescott, former deputy prime minister of the U.K.
And why shouldn’t the president push an aggressive clean energy policy when 97% of scientists agree that global climate change is a man-made crisis we have to fix now or suffer catastrophic consequences. This is a done deal. Anyone who claims otherwise is a denier. A heretic. A reactionary far-right zealot who lives in the dark ages. I’d like to point you to two unbiased scientific surveys. The first is a 2008 Harris Interactive study (on behalf of George Mason University) of 489 random members of the American Meteorological Society (AMS) and the American Geophysical Union. The second was a 2012 George Mason University survey of 1,862 members of the AMS. it’s obvious China’s heart isn’t really in it! “China is doing its utmost to reduce its carbon intensity,” said Xie (Xie Zhenhua, vice chairman of the National Development and Reform Commission). Mr Xie revealed that he had been personally told of the US move to curb power plant emissions in a phone call from America’s special envoy on climate, Todd Stern. He offered some support for the American move. “People in the US have quite differing opinions, some people supporting and there are also strong opposition, and the US government by making this decision have overcome many difficulties,” the negotiator explained. Mr Xie said that China would work hard to get agreement on a global climate treaty, agreed by all nations, in Paris in December 2015. China would be in a position to outline what it will be able to offer as part of that deal, in the first half of next year, he said. Having looked at the Link to Monktons’ debunking of the Cook paper ,I would like to ask what has happened since. I think Lord Monkton is an exceptionally clever guy ,but I do not get a lot of feedback down the line from his various threats ,to various parties, to sue, call the law in or otherwise expose bad science,I know everything is ongoing but I sometimes feel that there are too many cooks (to coin a phrase) spoiling the broth.Or too many windmills being attacked at the same time. If we were discussing strategy it would nice to be able to isolate a particular area of weakness within the alarmist set up and attack it relentlessly.To my mind the failure to provide empirical proof that CO2 causes Global Warming is the biggest failure of the Alarmist cause. Various lukewarmers who state that it may have provided a small amount of warming in accordance with Greenhouse theory do little to support our agenda. Any views on that ? To my mind the failure to provide empirical proof that CO2 causes Global Warming is the biggest failure of the Alarmist cause. Exactly my point for years now. They have no evidence making CO2 the culprit. Everything after that is just 97% of zero. Who cares about John Cook? He has nothing, never had anything and unless he can pull some real evidence out of his hat, he’ll never have anything. He should count himself lucky to still have 3% worth of credibility. As for your other question about a particular area of weakness, I think the lack of evidence for CO2 doing anything is the place to start. Hit them at every possible time and place with the challenge to show evidence that CO2 is causing anything. If you knock down the foundation of their fraud then gravity will do the rest. Actually the “consensus” should have been 21%. So notice that all of the “no position” papers were eliminated in the calculation. Using the Impacts row they went: (12+316+907)/(12+316+907+8+5+4) = 98.6% — and they eliminated some some papers to get down to 97%. However a better calculation would have been (12+316+907)/(12+316+907+4528+8+5+4)= 21%. And THAT is the actual “consensus”. That is, only 21% of papers AS RATED actually were: explicit endorsement with quantification or explicit endorsement without quantification or implicit endorsement.